1. Sixth seal: The opening of the sixth seal brings men to the recognition that God is sitting in judgment upon the earth. This seal is the announcement of the day. The seventh seal ushers the day of wrath into the fullness of its force upon mankind. 2. Intervention: Between these two seals judgment is arrest­ed to reveal grace in the midst of judgment. While no saved person can come into judgment, God can save men in the midst of judgment. 3. Inset: Here is the first inset of the book. The events of these parenthetical insets are not always chronological restricted to the main sequence of events which preceded and follows. They reach forward and backward. That is true here. "And after these things I saw four angels standing on the four corners of the earth, holding the four winds of the earth, that the wind should not blow on the earth, nor on the sea, nor on any tree." "And I saw another angel ascending from the east, having the seal of the living God: and he cried with a loud voice to the four angels, to whom it was given to hurt the earth and the sea," "Saying, Hurt not the earth, neither the sea, nor the trees, till we have sealed the servants of our God in their foreheads." "And I heard the number of them which were sealed: and there were sealed an hundred and forty and four thousand of all the tribes of the children of Israel." "Of the tribe of Juda were sealed twelve thousand. Of the tribe of Reuben were sealed twelve thousand. Of the tribe of Gad were sealed twelve thousand." "Of the tribe of Aser were sealed twelve thousand. Of the tribe of Nephthalim were sealed twelve thousand. Of the tribe of Manasses were sealed twelve thousand." "Of the tribe of Simeon were sealed twelve thousand. Of the tribe of Levi were sealed twelve thousand. Of the tribe of Issachar were sealed twelve thousand." "Of the tribe of Zabulon were sealed twelve thousand. Of the tribe of Joseph were sealed twelve thousand. Of the tribe of Benjamin were sealed twelve thousand." Israel is back in the picture after 2000 years. 144,000 are saved for purposes of evangelism. 12,000 from each tribe. God keeps good records and spared families from the likes of Hitler. Overcomers are not ones that are still struggling with the same sins over and over again. By grace they are given strength to rid themselves of that sin, Grace is a power of God working in man. (1 Cor. 15:10) and then God grants grace for the next sin. Many sins encompass an individual until they finally come to the stature of Christ at the end of the threefold ministry of Christ with the believer (John 13). Finally 1 John 3:2 is true. The ones who continue with the same sins over and over again are seen in Rev. 21:8 still attempting to conquer the listed sins or even acknowledge them as sins because the new religion of America has approved to a point all those listed with their new theology which is remodeled Pantheism. "But the fearful, and unbelieving, and the abominable, and murderers, and whoremongers, and sorcerers, and idolaters, and all liars, shall have their part in the lake which burneth with fire and brimstone: which is the second death." And then some preachers teach that saints can have a besetting sin they just can't conquer. Cf. Heb. 12:1. "Wherefore seeing we also are compassed about with so great a cloud of witnesses, let us lay aside every weight, and the sin which doth so easily beset us, and let us run with patience the race that is set before us,"
What is this besetting sin that plagues the (un)repentant? What is the sin which does so easily beset us? The sin which predominates this whole letter of Hebrews. That of unbelief. What is unbelief? Opposite of belief. See note on Heb. 11:39. To know and believe Truth's claim but to refuse to answer to His light. The writer was pleading with the Jewish nation to answer the light supplied concerning the Messiah, none other than Jesus Christ. Some refuse the light of scripture believing they have no need of a Savior with different levels of ignorance of the truth of the matter, some denying heaven, hell, Jesus, Satan. Unbelief covers the whole spectrum of people who refuse the light of scripture which provides answers. Some overcome this lie of Satan himself who teaches you shall not die with death everywhere. (4) Grace is a power of God working in man. (1 Cor. 15:10) "But by the grace of God, I am what I am"
(6) Grace is a realm of God into which men may enter by faith, abide, and experience all the blessings of Salvation. (Rom. 5:2, Acts 13:43) and be known as an overcomer in Rev. 21:7. Grace coupled with love never fails (1 Cor. 13:7-8). He loved us until the end. John 13:1. Seven wonderful promises were made to “him that overcometh” in the letters to the seven churches (Revelation 2:7,11,17,26; 3:5,12,21), and these are all summed up here. We shall share in the very inheritance of Christ Himself (Hebrews 1:2; Psalm 2:8; Romans 8:17; 1 Peter 1:4,5; 1 Corinthians 3:21-23). As sons of God by adoption by God’s grace (Romans 8:15), we share in the infinite inheritance of the one who is Son of God from eternity. The Matt. 5:48 promise is fultilled. Legal adoption as "sons." Grk word "huios" in Rev. 21:7. How it all started and what we have to overcome: The life of dependence upon God was the life of union and cooperation with God. Man (Adam) having chosen the position of independence, was cut off from that union and cooperation. To say this, is to declare that by man's own act, has become separated from that fellowship with God which constitutes his holiness of character; and from that cooperation with God, which is the condition of righteousness of conduct. He has passed into a region where the essential powers of his being can find no fitting field of operation. He retains the essential facts of his being, but they cannot be perfected, because they have lost their true sphere. Henceforward his intelligence must be bounded by its own limitation, as it is severed from the Infinite Knowledge. So also his emotion must become dwarfed as to capacity, because it has lost its perfect object in the loss of God and His will, a magnificent ruin, will perpetually attempt to secure mastership and yet will never succeed, because it has lost its own true spring of action, and its own Master. Man distanced from God has not lost the powers of his original creation; he has lost the true sphere of their exercise. His intelligence is darkened, his emotion is deadened, and his will is degraded. Darkened intelligence henceforth will see only the things that are near. The spaciousness of the spiritual condition has ceased, and man will look at material things in semi-blindness, which is at once tragic and pathetic. Deadened emotion, a heaven-born capacity, will attempt to satisfy itself wholly within the realm of the earth, and love being set wholly upon the things material, will forever be wounded in their loss. Degraded will, ever attempting to be authoritative, masterful, will always be thwarted, beaten, and overcome, not overcoming. Out of this dire and desolate ruin, God hears the call for a Deliverer. This threefold ruin must be overcome and by grace and the Leadership of Christ can be accomplished. Phil 3:12; Titus 2:12; Luke 6:40. This is a promise to be conformed to His image from Christ. Rom. 8:29. No excuses for failure 1 John 2:6; 1 Pet. 2:21; Phil 2:5-7. The New Commandment He gave us is John 13:34. And those that do love Him don't fail with His commands for they are empowed by His grace John 14:15. They overcome and await His return. Rev. 22:20-21. "And I beheld when he had opened the sixth seal, and, lo, there was a great earthquake; and the sun became black as sackcloth of hair, and the moon became as blood;" "And the stars of heaven fell unto the earth, even as a fig tree casteth her untimely figs, when she is shaken of a mighty wind." "And the heaven departed as a scroll when it is rolled together; and every mountain and island were moved out of their places." "And the kings of the earth, and the great men, and the rich men, and the chief captains, and the mighty men, and every bondman, and every free man, hid themselves in the dens and in the rocks of the mountains;" "And said to the mountains and rocks, Fall on us, and hide us from the face of him that sitteth on the throne, and from the wrath of the Lamb:" "For the great day of his wrath is come; and who shall be able to stand?" "And I beheld when he had opened the sixth seal, and, lo, there was a great earthquake; and the sun became black as sackcloth of hair, and the moon became as blood;" "And the stars of heaven fell unto the earth, even as a fig tree casteth her untimely figs, when she is shaken of a mighty wind." "And the heaven departed as a scroll when it is rolled together; and every mountain and island were moved out of their places." "And I beheld when he had opened the sixth seal, and, lo, there was a great earthquake; and the sun became black as sackcloth of hair, and the moon became as blood;" "And the stars of heaven fell unto the earth, even as a fig tree casteth her untimely figs, when she is shaken of a mighty wind." "And the heaven departed as a scroll when it is rolled together..."
1. The sun became black as sackcloth of hair. 2. The moon became as blood. 3. The stars of heaven fell unto the earth. 4. The heaven departed as a scroll. "And I beheld when he had opened the sixth seal, and, lo, there was a great earthquake..." "and every mountain and island were moved out of their places." 2. Every mountain was moved out of place. 3. Every island was moved out of place. 1. These are literal things that are taking place. cf. Isa. 13:9-13; 34:1-4; 51:6; 2:12-21; 24:1, 18-20; Amos 8:8-9, Haggai 2:6-7; Jer. 4:23-28; Ezek. 38:19-20; Joel 2:31. 2. These are set forth in the language of appear­ance. This is a favorite way for men of all races and climes to speak. Imagery always carries to the mind a greater emphasis than pure abstract language. 3. These do not designate mere social and political shake-ups. To interpret as such is to ignore Old Testament information. "And the kings of the earth, and the great men, and the rich men, and the chief captains, and the mighty men, and every bondman, and every free man, hid themselves in the dens and in the rocks of the mountains;" "And said to the mountains and rocks, Fall on us, and hide us from the face of him that sitteth on the throne, and from the wrath of the Lamb:" "For the great day of his wrath is come; and who shall be able to stand?" This marks the effect of the cosmological distur­bances upon men. Note: Here is a little insight into the future. Caste and class will persist in spite of the foolish dreams of men. This due to the fact that sin persists. "And the kings of the earth, and the great men, and the rich men, and the chief captains, and the mighty men, and every bondman, and every free man......" "And said to the mountains and rocks..."
Their physical reaction is fear and flight. They hid themselves in rocks and dens of the earth. They are utterly demoralized. Earthquakes are terrible things. Darkness in broad day is also terrible. They pray to the mountains and the rocks to fall on them. Their prayer is to nature, or else this is the language of appearance. But it is possible that this is the only god they know. "Fall on us, and hide us from the face of him that sitteth on the throne, and from the wrath of the Lamb:" "For the great day of his wrath is come; and who shall be able to stand?" They want to be hidden from the face of One Who sits on the throne. Bolshevists will know them. Godless scientists will recog­nize miracles then. The testimony of the martyrs, or a vision, or perhaps just the conscience of men will be enough to enable them to discern. It is the wrath of the Lamb. They have scoffed at Him. But not now. The wrath of the Lamb is fearful. His demeanor is changed. The question of "how long" and "when" has been answered.Psa. 3:6; 35:17; 74:9, 10: 79:5; 80:4; 82:2; 89:46; 90:13; 94:3-4; Matt. 24:3. The day of wrath is come. It is now impossible to escape. "Enter into the rock, and hide thee in the dust, for fear of the LORD, and for the glory of his majesty." "The lofty looks of man shall be humbled, and the haughtiness of men shall be bowed down, and the LORD alone shall be exalted in that day." "For the day of the LORD of hosts shall be upon every one that is proud and lofty, and upon every one that is lifted up; and he shall be brought low:" "And upon all the cedars of Lebanon, that are high and lifted up, and upon all the oaks of Bashan," "And upon all the high mountains, and upon all the hills that are lifted up," "And upon every high tower, and upon every fenced wall," "And upon all the ships of Tarshish, and upon all pleasant pictures." "And the loftiness of man shall be bowed down, and the haughtiness of men shall be made low: and the LORD alone shall be exalted in that day." "And the idols he shall utterly abolish." "And they shall go into the holes of the rocks, and into the caves of the earth, for fear of the LORD, and for the glory of his majesty, when he ariseth to shake terribly the earth." "In that day a man shall cast his idols of silver, and his idols of gold, which they made each one for himself to worship, to the moles and to the bats;" "To go into the clefts of the rocks, and into the tops of the ragged rocks, for fear of the LORD, and for the glory of his majesty, when he ariseth to shake terribly the earth." "Cease ye from man, whose breath is in his nostrils: for wherein is he to be accounted of?" "And when He had opened the fifth seal, I saw under the altar the souls of them that were slain for the word of God, and for the testimony which they held:" "And they cried with a loud voice, saying, How long, O Lord, holy and true, dost thou not judge and avenge our blood on them that dwell on the earth?" "And white robes were given unto every one of them; and it was said unto them, that they should rest yet for a little season, until their fellowservants also and their brethren, that should be killed as they were, should be fulfilled." "And when He had opened the fifth seal, I saw under the altar the souls of them that were slain for the word of God, and for the testimony which they held:"
"And when He had opened the fifth seal, I saw under the altar the souls of them that were slain for the word of God, and for the testimony which they held:" "And they cried with a loud voice, saying, How long, O Lord, holy and true, dost thou not judge and avenge our blood on them that dwell on the earth?" It is obviously for their faith that they are killed. Being under the altar is symbolism for being under the blood (Rev. 12:11; 13:7, 15). They address the Lord as, "0 Despot." By this they confess that they belong to the Lord and have been purchased by him. They understand that judgment has begun, and they wonder why they are not avenged upon their enemies. These are martyrs of the endtime who paid with their lives because they refused to recant of their faith. Herein are some suggestions as to the intermedi­ate state where intermediate (temporary) bodies are supplied. These souls are in heaven. They are under the protection and care of Christ. They are able to speak. They have some knowledge of what is going on in the earth. They have access and communion with Christ. They are clothed with white robes. These are a kind of intermediate body. These souls are resting. In the song that is now sung, echoing and reechoing through the corridors of heaven, is the fulfillment of God's purpose in Grace (Eph. 1:5-6, 12, 14). They praise Him because in His grace He has redeemed them from utter loss and has exalted them to the highest of all posi­tions. Rev. 1:6; 20:6 would support this position. The cup of iniquity is not yet full. It must grow and develop before the Lord is ready to draw his sword in judgment upon the wicked. Two companies will yet join the ranks of the slain. The definite article appears with each group. They are (1) fellow servants, one group serving perhaps in the same capacity as them­selves, and (2) brethren in the faith who are not serving in exactly that capacity. The fellow servants may be Gentiles and the brethren may be Jewish saints. "And when he had opened the fourth seal, I heard the voice of the fourth beast say, Come and see." "And I looked, and behold a pale horse: and his name that sat on him was Death, and Hell followed with him. And power was given unto them over the fourth part of the earth, to kill with sword, and with hunger, and with death, and with the beasts of the earth." The adjective "pale" means green, like as a corpse. Same word in 8:7 "green grass." Our society today is a "green" society. Attempting to preserve the earth. This one is clearly names "Death." "Hell," original, Hades, with gaping mouth swallows up the souls of those who die. By metonymy, the effect is placed for the cause which is plagues and pestilence (1 Kings 8:37; Jer. 14:12; 21:7) like the "Black Death," the Bubonic plague. "If there be in the land famine, if there be pestilence, blasting, mildew, locust, or if there be caterpillar; if their enemy besiege them in the land of their cities; whatsoever plague, whatsoever sickness there be;"
"When they fast, I will not hear their cry; and when they offer burnt offering and an oblation, I will not accept them: but I will consume them by the sword, and by the famine, and by the pestilence." "And afterward, saith the LORD, I will deliver Zedekiah king of Judah, and his servants, and the people, and such as are left in this city from the pestilence, from the sword, and from the famine, into the hand of Nebuchadrezzar king of Babylon, and into the hand of their enemies, and into the hand of those that seek their life: and he shall smite them with the edge of the sword; he shall not spare them, neither have pity, nor have mercy." In the song that is now sung, echoing and reechoing through the corridors of heaven, is the fulfillment of God's purpose in Grace (Eph. 1:5-6, 12, 14). They praise Him because in His grace He has redeemed them from utter loss and has exalted them to the highest of all posi­tions. Rev. 1:6; 20:6 would support this position. Population is reduced by one fourth. cf. Ezek. 14:21 "For thus saith the Lord GOD; How much more when I send my four sore judgments upon Jerusalem, the sword, and the famine, and the noisome beast, and the pestilence, to cut off from it man and beast?" Pestilence - flu, typhus, etc. Wild beasts - grown ferocious because of so many dead bodies. "And when he had opened the third seal, I heard the third beast say, Come and see. And I beheld, and lo a black horse; and he that sat on him had a pair of balances in his hand." "And I heard a voice in the midst of the four beasts say, A measure of wheat for a penny, and three measures of barley for a penny; and see thou hurt not the oil and the wine." "Having predestinated us unto the adoption of children by Jesus Christ to himself, according to the good pleasure of his will," "To the praise of the glory of his grace, wherein he hath made us accepted in the beloved." "That we should be to the praise of his glory, who first trusted in Christ." "Which is the earnest of our inheritance until the redemption of the purchased possession, unto the praise of his glory." This follows on the heels of the red horse and clearly symbolizes famine and starvation (Jer. 1:2-6; Jer. 14:1-6; Lam. 4:8-9; 5:10; Ezek. 4:10, 16, 17). "To whom the word of the LORD came in the days of Josiah the son of Amon king of Judah, in the thirteenth year of his reign." "It came also in the days of Jehoiakim the son of Josiah king of Judah, unto the end of the eleventh year of Zedekiah the son of Josiah king of Judah, unto the carrying away of Jerusalem captive in the fifth month." "Then the word of the LORD came unto me, saying," "Before I formed thee in the belly I knew thee; and before thou camest forth out of the womb I sanctified thee, and I ordained thee a prophet unto the nations." "Then said I, Ah, Lord GOD! behold, I cannot speak: for I am a child." etc. This one may very well be the same as above, the Antichrist. He inaugurates a system of ration­ing as indicated by the balances. cf. Rev. 13:16-17. "And he causeth all, both small and great, rich and poor, free and bond, to receive a mark in their right hand, or in their foreheads:" "And that no man might buy or sell, save he that had the mark, or the name of the beast, or the number of his name." Penny is a day's wages and buys only enough for one person (cf. Matt. 20:2, 9). "And when he had agreed with the labourers for a penny a day, he sent them into his vineyard." "And when they came that were hired about the eleventh hour, they received every man a penny." This means that food is scarce and high-priced. Three measures of barley is the amount of food for animals. There is the suggestion that humans finally resort to the food being eaten by animals. The price of a measure is 1/8 of a penny, so prices have gone up 8 times. Wheat was priced at 1/8 of a penny normally, but now has gone up. Oil and wine are the rich man's food. Grain may cease, but vines and trees are hardier and go on living. The rich thus get their supply of food. "And when he had opened the second seal, I heard the second beast say, Come and see." "And there went out another horse that was red: and power was given to him that sat thereon to take peace from the earth, and that they should kill one another: and there was given unto him a great sword." The Red horse signifies war. The red dragon sig­nifies the devil, and he is the god of war. Cf. Rev. 20:7-8; 12:7; 16:13-14: referring respec­tively to the battle of Gog and Magog; war in heaven; and the great day of God Almighty. "And when the thousand years are expired, Satan shall be loosed out of his prison," "And shall go out to deceive the nations which are in the four quarters of the earth, Gog and Magog, to gather them together to battle: the number of whom is as the sand of the sea." "And there was war in heaven: Michael and his angels fought against the dragon; and the dragon fought and his angels,"
"And I saw three unclean spirits like frogs come out of the mouth of the dragon, and out of the mouth of the beast, and out of the mouth of the false prophet." "For they are the spirits of devils, working miracles, which go forth unto the kings of the earth and of the whole world, to gather them to the battle of that great day of God Almighty." This is doubtless the same rider as on the white horse. He has a sword which means war (Jer. 25:29-33). This sword is great. The rider, who may well be the Antichrist, will be a great military genius (Rev. 13:3). He will hold his place by might. "For, lo, I begin to bring evil on the city which is called by my name, and should ye be utterly unpunished? Ye shall not be unpunished: for I will call for a sword upon all the inhabitants of the earth, saith the LORD of hosts." "Therefore prophesy thou against them all these words, and say unto them, The LORD shall roar from on high, and utter his voice from his holy habitation; he shall mightily roar upon his habitation; he shall give a shout, as they that tread the grapes, against all the inhabitants of the earth." "A noise shall come even to the ends of the earth; for the LORD hath a controversy with the nations, he will plead with all flesh; he will give them that are wicked to the sword, saith the LORD." "Thus saith the LORD of hosts, Behold, evil shall go forth from nation to nation, and a great whirlwind shall be raised up from the coasts of the earth." "And the slain of the LORD shall be at that day from one end of the earth even unto the other end of the earth: they shall not be lamented, neither gathered, nor buried; they shall be dung upon the ground." This is the privilege and power that is placed in the hand of the rider. If people welcome Antichrist, then they must expect to receive what he brings. The great sword means universal strife. There will be racial, national, and civil strife. Anarchy and lawlessness will plunge the world into seas of blood. "And I saw when the Lamb opened one of the seals, and I heard, as it were the noise of thunder, one of the four beasts saying, Come and see." "And I saw, and behold a white horse: and he that sat on him had a bow; and a crown was given unto him: and he went forth conquering, and to conquer." This is true in every one of the seals that is opened (1, 3, 5, 7, 9, 12; 8:1). This judgment is apparently carried out through one of the creatures of God, and is therefore providential. This is true for the other three of the first four seals. In the last three, no living creature is involved. This has been held to be the gospel. But the other symbolism is certainly inappropriate for the gospel. The white horse of Rev. 19:11ff, however, provides a basis for the solution. More than likely this is counterfeit dressed up to appear as the gospel. Cf. Matt. 24:5 with 2 Thess. 2:3-12. This is Antichrist and not Christ. Christ opens the seals. Antichrist is associated with false religion. It is headed up in him. The bow is the long-range weapon, and therefore the providential aspect (Hab. 3:8-9; Psa. 45:1-6). The sword is the short-range weapon and suggests that which is immediate. That is what Christ uses when he comes to glory (Rev. 19:11ff). Inasmuch as men have given themselves to unbe­lief, God gives them what they want and allows the Antichrist to appear and men to believe that he is the Christ. This is the strong delusion he sends upon them. Nor will this be strange since many today believe that this white horse is the Christ (2 Thess. 2:9-12). "Even him, whose coming is after the working of Satan with all power and signs and lying wonders," "And with all deceivableness of unrighteousness in them that perish; because they received not the love of the truth, that they might be saved." "And for this cause God shall send them strong delusion, that they should believe a lie:" "That they all might be damned who believed not the truth, but had pleasure in unrighteousness." This must mean that Antichrist rises to promi­nence in political and religious realms Cf. 2 Thess. 2:3-4; Rev. 13:2-4. This marks a progressive career. Triumph is added to triumph and position to position, until he reaches the top both religiously and politically. Cf. Dan. 7:24; Rev. 17:12-13; Rev. 13:7. The throne of judgment has been set in the heavens. The Lion of the tribe of Judah, the Lamb of God, has prevailed to open the seals of the book. This book is the title deed to the universe, and Christ has the only right to break those seals and take possession of His earth that has been so long usurped by interlopers. All created intelligences of heaven and earth wait expectantly for the performance of this most dramatic of all scenes, the taking of the book and the opening of the seals. The Church is now about to witness from above the event for which she has prayed, longed for, and labored through the centuries. There are really two series. The first four, the four horsemen, deal with the earth; while the last three portray the heavenly aspect. The first seal is opened and the deed is unrolled, followed by the events it portrays; then the next seal is broken and the scroll is unrolled a bit further, unleashing the events it contains. Then the third seal is broken, the book is unrolled still further, unloosing the events it guards. So it continues through­out the breaking of the seven seals. The breaking of every seal is dramatic with interest and the spectators wait with bated breath to see the tremendous effect that will follow. Heaven is the witness to these events and the earth is the one which experiences these providential movements of the Son of God. The seals are the legal protection for the title deed through the centuries. That title deed had long been made by a transaction between the Father and the Son, of Judah it is predicted, in Gen 49:8-12, 1 Chron. 5:2, Psa. 2:7-8, and the deed had been filed away until the appointed time. After the passing of centuries and when the fullness of time was come, God sent forth his Son made of a woman, made under the law, and He went to Calvary, where He actually redeemed the earth at awful price, the price of His own life's blood. Now He is fully qualified to open the seals and enter into possession of his own property. "I will declare the decree: the LORD hath said unto me, Thou art my Son; this day have I begotten thee." "Ask of me, and I shall give thee the heathen for thine inheritance, and the uttermost parts of the earth for thy possession." The horses sent forth on their errand of judgment, by the opening of the first four seals, signify strength and power (Job 39:19-25; cf. 2 Kings 6:15-18; Zech. 1:8-10; 6:1-8). They are agents of God in bringing judgment upon the world. Christ is not appearing immediately in the earth to execute judgment, such as He will do when He returns in glory (Ch. 19). But He is allowing the world of sinful men to take its course, which amounts to its own undoing. The spiritual state of things following the rapture of the church leads from one woe to another until finally cosmo­logical disturbance runs its course through the entire fabric of nature, announcing to men the approach and appearance of the day of wrath. "Hereafter" of 4:1 is the time signal for the beginning of the opening of the seals. The catching away of the church ushers in the tribulation period (2 Thess. 2:6-7). This week of years has particular relation to Israel and the working out of God's purpose among the nations. Again will the Lord deal with Israel and the nations as He did in Egypt. A particular cycle will run its course again. God has been dealing with the nations by invitation, explanation, exhortation, demonstration. But during that period God will resort to compulsion. In this chapter we will note God vindicating Himself by means of judgment. This will explain in part some of the reaction noted in chapter 7. "And now ye know what withholdeth that he might be revealed in his time." "For the mystery of iniquity doth already work: only he who now letteth will let, until he be taken out of the way." Chapter 11:1-3 provides the chronological framework. Chapter 6:1-2 provides the inception. Events of Chapters 6-19 require seven years for fulfillment. "And there was given me a reed like unto a rod: and the angel stood, saying, Rise, and measure the temple of God, and the altar, and them that worship therein." "But the court which is without the temple leave out, and measure it not; for it is given unto the Gentiles: and the holy city shall they tread under foot forty and two months." "And I will give power unto my two witnesses, and they shall prophesy a thousand two hundred and threescore days, clothed in sackcloth." (1) White horse Rev. 6:2 Matt. 24:5 Those coming in the Name of Christ. (2) Red horse - War Rev. 6:4 Matt. 24:6-7a Wars and rumors of wars. (3) Black horse - Famine Rev. 6:6, 8 Matt. 24:7b Famines, etc. (4) Pale horse - Death Rev. 6:8 Matt. 24:6-7 This naturally follows. (7) Seventh Seal - 7 trumpets, 7 angels, 7 vials Matt. 24:30-31 In the song that is now sung, echoing and reechoing through the corridors of heaven, is the fulfillment of God's purpose in Grace (Eph. 1:5-6, 12, 14). They praise him because in his grace he has redeemed them from utter loss and has exalted them to the highest of all posi­tions. Rev. 1:6; 20:6 would support this position. 1) That these three series traverse the same ground and are therefore simultaneous. The same thing is presented in three different ways. 2) That these three series cover different areas of time and are to be understood as successive. This means that the same thing is not being said in three different ways. The three series present the progressive events in the unfolding of the tribulation years. The seven seals are opened in order. The seven trumpets come out of the seventh seal. The seven vials are last in the series (Rev. 15:1, 5-8). The three series present the successive move­ments in the history of the tribulation week. Ordinals are used of the seals, trumpets, and vials which mark a series in succession. "Another sign" (15:1) marks another in suc­cession, and this one the last. "And I saw another sign in heaven, great and marvellous, seven angels having the seven last plagues; for in them is filled up the wrath of God." The three series present an increasing intensity in the judgments being administered. The 6th seal is worse than the preceding 5 (Rev. 6:12-17). The 7th seal is worse than the preceding 6 (Rev. 7:1; 8:1). The last three trumpets are worse than the first four and are called woes (Rev. 8:13). The seventh trumpet is worse than the preceding because it contains the last plagues (Rev. 11:14-17; Rev. 15:1) and in these last plagues is filled up the wrath of God. "And I saw in the right hand of him that sat on the throne a book written within and on the backside, sealed with seven seals." "And I saw a strong angel proclaiming with a loud voice, Who is worthy to open the book, and to loose the seals thereof?" "And no man in heaven, nor in earth, neither under the earth, was able to open the book, neither to look thereon." "And I wept much, because no man was found worthy to open and to read the book, neither to look thereon." "And one of the elders saith unto me, Weep not: behold, the Lion of the tribe of Juda, the Root of David, hath prevailed to open the book, and to loose the seven seals thereof." "And I beheld, and, lo, in the midst of the throne and of the four beasts, and in the midst of the elders, stood a Lamb as it had been slain, having seven horns and seven eyes, which are the seven Spirits of God sent forth into all the earth." "And he came and took the book out of the right hand of him that sat upon the throne." "And when he had taken the book, the four beasts and four and twenty elders fell down before the Lamb, having every one of them harps, and golden vials full of odours, which are the prayers of saints." "And they sung a new song, saying, Thou art worthy to take the book, and to open the seals thereof: for thou wast slain, and hast redeemed us to God by thy blood out of every kindred, and tongue, and people, and nation;" "And hast made us unto our God kings and priests: and we shall reign on the earth." "And I beheld, and I heard the voice of many angels round about the throne and the beasts and the elders: and the number of them was ten thousand times ten thousand, and thousands of thousands;" "Saying with a loud voice, Worthy is the Lamb that was slain to receive power, and riches, and wisdom, and strength, and honour, and glory, and blessing." "And every creature which is in heaven, and on the earth, and under the earth, and such as are in the sea, and all that are in them, heard I saying, Blessing, and honour, and glory, and power, be unto him that sitteth upon the throne, and unto the Lamb for ever and ever." "And the four beasts said, Amen. And the four and twenty elders fell down and worshipped him that liveth for ever and ever." The proper interpretation of this book is a crucial matter. 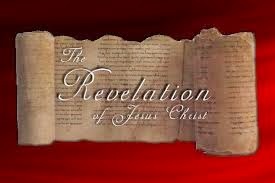 The popular idea is that this is a book of revelation of what is to follow (Isa. 29:11-12; Dan. 12:4, 8-9). Some think it to be a prophetic history of the church. Others think it is the covenant with Israel yet to be made (Heb. 10:16-17). But it must be remembered that books were scrolls in that day. This is written inwardly and outwardly and sealed with seven seals. Archeology has since brought to light just such books as this. Consult Biblical Review for Oct. 1922. This book was like the one Jeremiah made at the time Nebuchadnezzar overran Jerusalem and Judea (Jer. 32:6-16). "And I saw a strong angel proclaiming with a loud voice, Who is worthy to open the book, and to loose the seals thereof?" "And no man in heaven, nor in earth, neither under the earth, was able to open the book, neither to look thereon." An intensive and extensive search is instituted to discover a man who can open this book. But though heaven and earth and the nether world is searched, no man is discovered. In fact, the original says that no one, no creature of any kind, was found worthy to open the title deed. Adam forfeited the right to do so, and all his progeny. Angels are outside the pale. In fact, the only One who has the right to open a deed is the Owner. "And I wept much, because no man was found worthy to open and to read the book, neither to look thereon." The result of the search is watched with keen interest by John, one of the redeemed from the earth. When no one is found, he bursts into tears and uncontrollable weeping, and for sheer sorrow is unable to stop. He weeps as one would weep at a funeral for one who passes on and will never return. This little book is the title deed to the universe. The devil and his emis­saries have usurped it and are in possession of it even though they do not own it. To think that the devil will always remain in possession of it is more than John can stand. "And one of the elders saith unto me, Weep not: behold, the Lion of the tribe of Juda, the Root of David, hath prevailed to open the book, and to loose the seven seals thereof." "And I beheld, and, lo, in the midst of the throne and of the four beasts, and in the midst of the elders, stood a Lamb as it had been slain, having seven horns and seven eyes, which are the seven Spirits of God sent forth into all the earth." "And he came and took the book out of the right hand of him that sat upon the throne." The lion prevailed to open the book (5). The lamb took the book (6-7). The lamb is worthy to take the book and open its seals (8-9). The lamb opens the seals (6:1ff). The Lion is the symbol of power and kingly authority. Being from the tribe of Judah, He is in the line of kings (Gen. 49:10). Being the root of David marks His kinship. He is in the royal line and heir to the throne. And He has prevailed (overcome). The aorist of this word marks a single event which gave Him authority to open the seven seals. The scene changes even while John is looking at the Lion. And as it changes he sees a Lamb in the midst of the throne. It is slain, and the perfect tense indicates the fact is permanent. The marks of death are upon the Lamb even as He displays His perfect fullness of strength by the seven horns and His perfection of knowledge and wisdom by the seven eyes. This is none other than the Lamb of God, the Lord Jesus Christ, with marks of Calvary upon Him. John recognizes Him immediately. By the print of the nails in his hand." "And he came and took the book out of the right hand of him that sat upon the throne." This scene is one of the most dramatic in the Bible. Here is the focal point of all the ages. A ruined earth in the hands of the devil, a redeemed earth potentially with a waiting host looking forward to the actual taking of pos­session of the earth. John watches intently to see what will happen. The Lamb steps up and takes the book and having taken it, He holds it firmly in His grasp (perfect tense), for never again will it escape Him. Today, every redeemed soul is an earnest of the purchased possession (Eph. 1:13). In Daniel 7:13 there is the same subject, but from the aspect of taking possession and reigning. The breaking of the seals of the title deed is symbolic of Christ casting out the usurpers of the earth, preparatory to the taking possession of the universe. "And when he had taken the book, the four beasts and four and twenty elders fell down before the Lamb, having every one of them harps, and golden vials full of odours, which are the prayers of saints." "And they sung a new song, saying, Thou art worthy to take the book, and to open the seals thereof: for thou wast slain, and hast redeemed us to God by thy blood out of every kindred, and tongue, and people, and nation;" "And hast made us unto our God kings and priests: and we shall reign on the earth." "And I beheld, and I heard the voice of many angels round about the throne and the beasts and the elders: and the number of them was ten thousand times ten thousand, and thousands of thousands;" "Saying with a loud voice, Worthy is the Lamb that was slain to receive power, and riches, and wisdom, and strength, and honour, and glory, and blessing." "And every creature which is in heaven, and on the earth, and under the earth, and such as are in the sea, and all that are in them, heard I saying, Blessing, and honour, and glory, and power, be unto him that sitteth upon the throne, and unto the Lamb for ever and ever." "And the four beasts said, Amen. And the four and twenty elders fell down and worshipped him that liveth for ever and ever." "And when he had taken the book, the four beasts and four and twenty elders fell down before the Lamb, having every one of them harps, and golden vials full of odours, which are the prayers of saints." "And they sung a new song, saying, Thou art worthy to take the book, and to open the seals thereof: for thou wast slain, and hast redeemed us to God by thy blood out of every kindred, and tongue, and people, and nation;" "And hast made us unto our God kings and priests: and we shall reign on the earth." The four living creatures representing all creation and the elders representing all re­deemed mankind (the church) fall down before the Lamb. They are equipped with harps, the instru­ments for praise. Each one of them have in their hands golden bowls full of incense which represents the prayers of the saints. For more than 2000 years they have prayed, "thy kingdom come" and the prayers have gone unan­swered. But now the fulfillment is at hand. "And I beheld, and I heard the voice of many angels round about the throne and the beasts and the elders: and the number of them was ten thousand times ten thousand, and thousands of thousands;" "Saying with a loud voice, Worthy is the Lamb that was slain to receive power, and riches, and wisdom, and strength, and honour, and glory, and blessing." Angels in glory have not be privileged to enter into the experience of salvation in the same respect as mankind. They have been ministers to God's children (Heb. 1:14). They have watched the church through the centuries (1 Cor. 4:9; Eph. 3:10). They have longed to enter into this experience (1 Pet. 1:12). But now that they hear the host of the redeemed praise the Lamb, this intoxicating joy sweeps over them and in countless millions they too join in the redemp­tion song. "And every creature which is in heaven, and on the earth, and under the earth, and such as are in the sea, and all that are in them, heard I saying, Blessing, and honour, and glory, and power, be unto him that sitteth upon the throne, and unto the Lamb for ever and ever." "And the four beasts said, Amen. And the four and twenty elders fell down and worshipped him that liveth for ever and ever." Heaven cannot hold the praise that is now reverberating through its halls. In ever widening circles it sweeps through heaven and then through the entire universe. The redeemed in glory begin the song; the angels in heaven catch it up; then every other creature in heaven joins the throng; overflowing the ramparts of heaven it sweeps through the earth and every creature there joins in the song; and finally even the host of lost, subdued insurgents from creation lift their voices to acknowledge now what they refused to acknowledge during the day of salvation. So far as the vision is concerned, it appears that the entire movement of praise takes place at once. But it is more reasonable to believe that it begins at this moment in the throne and then in ever lengthening and widening circles reaches out across the years of the tribulation, the millennium and eternity. We now have the answer to some very important questions. 1. Why did God permit sin to enter the creation in the beginning? It was that His grace might be manifest and through grace all glory might come to Him. 2. Why does God delay judgment now when it seems to be so much needed? Because by delay many more will be saved and join the vast throng of the redeemed to give Him the glory. Delay in judgment will enable all the world to become entirely ripe and prove irrefutably that God must intervene in human affairs. 3. What will God accomplish in the end by His marvelous plan? He will prove His faithfulness, His sufficiency, and the desperate character of the human heart. In the song that is now sung, echoing and reechoing through the corridors of heaven, is the fulfillment of God's purpose in Grace (Eph. 1:5-6, 12, 14). They praise him because in His grace He has redeemed them from utter loss and has exalted them to the highest of all posi­tions. Rev. 1:6; 20:6 would support this position.